Now in my thirties, I decided it was time to visit a health professional to see what my body might need that it is not producing for itself. Yawn, I know. But I've decided aging gracefully is really my best option considering aging is not an option at all. My mother can attest to the fact that I am no fan of vitamins, since she's been trying to get a handful of horse pills down me since I was a kid. But I'm an adult now, and therefore responsible for my own nutrition. Looking at my new list of supplements, I quickly realized this was already a lost cause if I couldn't get excited about it. I had to get motivated. You can find this and some other fun pill-popping incentives here. And that's my shameless pill box plug. I'm just not sure all my pills are actually going to fit into this wee box. I suppose I was hoping I'd just find that I have a huge vitamin D deficit and leave with a prescription for more sunshine. But it's more serious than that. I haven't even had my blood test, and I'm already taking three new pills. Turns out our human bodies have stopped producing vitamin C altogether. Some animals, like goats, still produce it. So now I am supposed to pop 6,000 milligrams of C every day. I think this nutritional boost may require taking out a loan. But I'm going to need all the support I can get my hands on to get through the mountain of reading material that I've waded into. I honestly don't know how it came to this. No, that's not true. I know it was a combination of bookstore visiting, walking by sale racks, and recommendations of friends. It's my environment, one could argue. But before I knew what was happening, I'm treading water in the bibliophilic deep end. 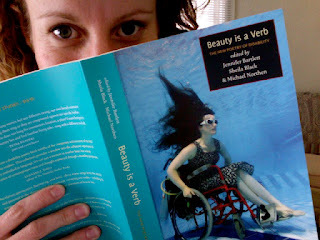 And that's why I really should not have purchased an anthology of poetry by writers with disabilities called Beauty is a Verb, which I happened upon on display at a local bookstore. But look at the cover––it's irresistible. I've been so busy climbing on ribbons and nursing under-the-weather emotions this week, that I've only skimmed through, but this book is already lifting my mood. If that woman can scuba dive at the bottom of a pool in a wheelchair, I think I can pick myself up off the floor and open a book. If I remember to take my vitamins, that is. After all, being normal is, indeed, so overrated. hope we can still be friends. I kind of miss you. hey, you might like Kevin Trudea's book called 'Natural Cures they Don't want you to Know about." Also, I think that much vitamin C is way too much. Maybe 3 times a week, and like 80% less that amount. A good one is from a whole source called 'Pure Radiance C' by the Synergy Company. See, not all C's are made alike!! P.S. Does that poetry anthology feature Jillian Weise? Her novel The Colony is really good - I feel like you would like it!